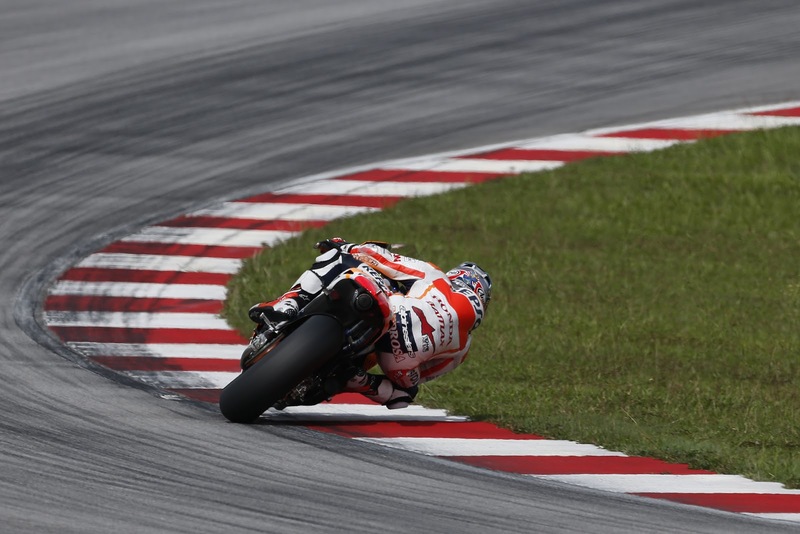 Sepang Day 3: Repsol Honda white wash, with top 4 covered by half a second. The final day of the official IRTA test in Sepang got off to a steady start as the track dried out throughout the morning, following heavy downpours overnight. As the track became drier, the times fell, and by the end of the day it was Dani Pedrosa who ended up on top, with a 2m 0.562s lap. Pedrosa was just 0.081s ahead of his rookie team mate, Marc Marquez; of whom had a minor off earlier in the session, but remained unhurt to set his best time on lap 54/54. Whilst Jorge Lorenzo put in a time yesterday that was 0.280s ahead of Pedrosa’s time of today, the reigning World Champion currently sits in 3rd, over 4 tenths behind Pedrosa. Though the Spaniard was largely concentrating on times over a race distance throughout the session. His team mate Valentino Rossi wasn’t far behind, putting in a 2m 1.062s toward the end of the day. Rossi was shadowed by Alvaro Bautista on the GO&FUN Gresini Honda, who improved on his time from day two by nearly 2 tenths. Cal Crutchlow pursued the Gresini rider, finishing the day in 6th, 0.016s behind. Crutchlow was over 2 tenths ahead of LCR Honda rider, Stefan Bradl in 7th. Outside of the 1 second barrier (and only just) was Ducati’s Andrea Dovizioso. The Italian who has been making good progress on the Desmosedici throughout the week finds himself over 4 tenths quicker than his team mate Nicky Hayden, who sits just below him on the leader board, in 9th. Randy de Puniet was the first of the CRT riders in 13th, who is nearly 2 tenths ahead of Ben Spies, still recovering from a shoulder injury whilst getting to grips with his Pramac Ducati. Avintia Blusens rider, Hector Barbera was the second CRT in 16th place, lying 2.5 seconds why of the top. Behind him in 18th place was the CRT ‘champion’ from 2012, Aleix Espargaro, who was followed by Karel Abraham and Colin Edwards, all within a second of Barbera’s time. A little further back is WSBK refugee, Hiroshi Aoyama, he was shadowed very closely by the quickly progressing Michael Laverty, on the British built, Aprilia engined, PBM CRT bike. Laverty has already improved on his time he set on day 2 by well over 3 seconds – very speedy development, indeed. Pesek and Petrucci of IodaRacing were 2 tenths behind the PBM bike, with Claudio Corti making steady improvement lying in 25th place. The ART PBM CRT (insert other acronym) bike of Yonny Hernandez ended the day just a hair width behind Corti, and Bryan Staring closely following, also. The next round of testing for the MotoGP boys all together, is on the 15th-17th of March, from Jerez. All relevant dates about the coming season can be found on our MotoGP page here. Previous Previous post: Capella and Trayler at MotoDex Performance First Suzuki in BSB STK1000 for 2013.